My 14-year old English student had to cancel next week’s lesson because he said he would be in Outer Mongolia. Before I could ask why or even intimate a look of confusion, Andy told me about his seven-day trip dedicated to plant trees hoping to: 1) generate more oxygen and improve air quality, and 2) to shield and mitigate dust storms. 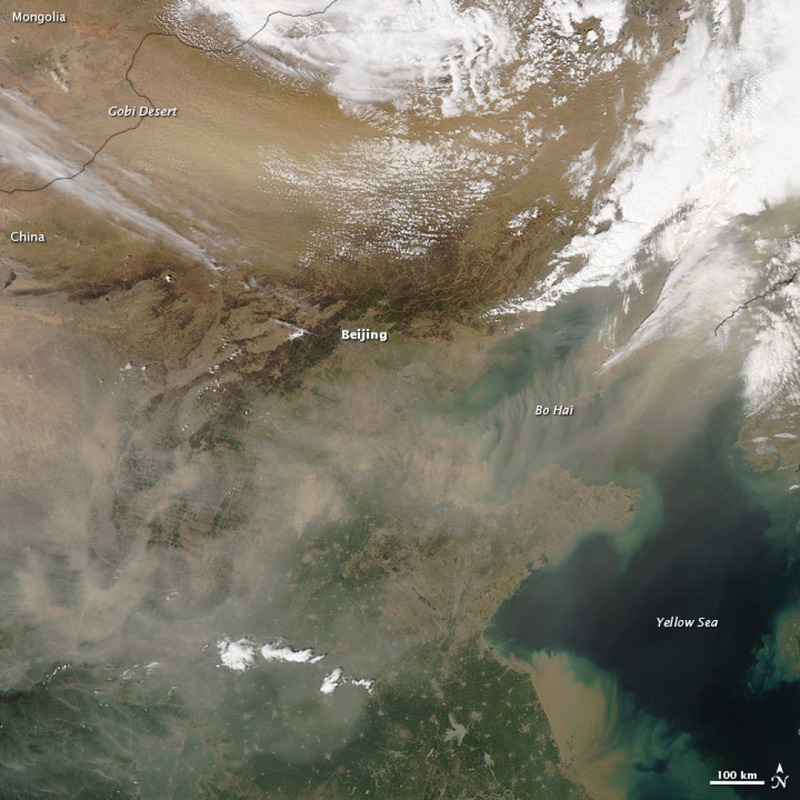 During the spring and early summer months, Beijing becomes a foster home for sporadic sweeps of dust otherwise known as Asian Dust or Yellow Dust. Here, dust storms leave cars and bicycles painted in dust. We observe dense and pale-yellowed clouds on the skyline and enjoy rad lightning and thunder storms. While on the surface level, dust is just a petty inconvenience that trails in after you and gets into your shoes, irritates your eyes, and finds refuge in your home– the issue is much deeper. In the past decade in a half, researchers and scientists at NASA as well as concerned citizens have examined this situation in greater depth. Between China, Manchuria, and Inner/Outer Mongolia, issues of desertification and deforestation (due to overexploitation of land and natural resources for human activities) are ricocheting and manifesting as your seasonal dust storms. Little do we know, we are actually breathing even more pollutants and toxins during this time of the year…. While I commend volunteers for their efforts, I am not sure of its impact. Do you think planting trees is a long-term solution or a quick fix? What kind of resolution do you suggest? This entry was posted in Beijing, Do and tagged environment, terry. Terry (San Francisco) is a hungry nomad, California native, and lover of indie music and movies. After a year of teaching and backpacking abroad, she is back in the arms of the Peninsula as a credential and master’s candidate. Apart from history and education, her passions include fashion and design, writing, good eats, and non-profit work. / Say hello on Twitter or Instagram @miss_guo. What a lovely student you have. I remember the yellow dust storms while I was in Korea. It was scay and I felt like I was a character in a science fiction film. People only walked outdoors if they had the cotton masks to protect their mouth and nostrils. I don’t know if planting trees is the best solution but I believe anything helps and influences. If a 14 year old can do something so beautiful at a young age imagine the things he/she could do as an adult? I think it’s a great start, especially for children to create awareness. I agree, Jeno! These kids are off to a good start and I’m so glad to see that they are so environmentally conscious. However, to achieve long-term changes, I think China as a country must take more responsibility. For one, adopting more sustainable farming practices (to prevent overgrazing and land exhaustion) would go a long way in saving these deserts. This is a big problem here too and I know many Koreans go to Mongolia to plant trees. Apparently it’s really difficult to plant trees in desert (of course, right?) but I think people do it because it’s something that could make a difference in the long term. And as far as I know, it does really make a difference. Still, as you say, if Chinese government gets more interested in environmental issues like these and prevent problems before they become problems, that might be the best solution. Sounds like a good idea, as long as they’re planting the right trees! There’s a great post at this blog on the problems caused by planting too many cedars in Japan. You make a good point! I never even considered that. I’m not sure what kinds they are planting, hopefully they’ve done some research. And thanks for sharing the blog post. Very cool blog!